In 1159 the first king of Portugal, Afonso Henriques, placed a mysterious seal on a charter that awarded the Knights Templar one third of his new, hard-won territory -- an extraordinary move for a new monarch. On this strip of land the Templars would erect they most famous and lasting monuments: the Mother of All Churches dedicated to Mary Magdalene, and a rotunda with no door; visitors accessed the interior of the building via a secret chamber used for the investiture of new knights, or to administer the inner brotherhood's most secret rite, the 'raising of the dead'. SEAL OF CERAS The king of Portugal's seal on the Charter of Ceras awarding the Templars a third of the country. But why does it read PORTUG-R-AL ? The king's seal contains an anagram and reveals why the Templars were awarded this territory and why they patiently waited forty years to receive it. Secret societies love their symbols because, just like parables, to the casual viewer they convey one message while to the initiate of the Mysteries they conceal another. At first sight the seal with its scrambled letters form the word PORTUGAL. To the esoteric reader it reveals something altogether deeper, an added R, PORTU-GRAL. But to an initiate it reads, in Portuguese, POR TU O GRAL: "Through You The Grail." Is it possible the Templars inherited one-third of Portugal under unusual circumstances and there deposited their most famous artifact? To understand how we got to this point we must first return to the moment when the Templars became an official order. In 1118 a new king of Jerusalem was chosen, Baudoin de Bourcq. Barely had Baudoin gotten used to his newly appointed seat when he received a visit from Hugues de Payen and Godefroi de Saint-Omer, as though the two proto-Templars were presenting their credentials. Whatever Hugues and Godefroi pitched the new king it sold him, and soon after, a small, close-knit group of knights moved into premises on Temple Mount to became officially known as the Knights Templar. This is the official historical record. But new evidence shows that, seven years earlier, the Templars were already present and materially active in another land two thousand miles to the west, and through their intervention, this secret endeavour became their greatest accomplishment -- the creation of Europe's first independent nation-state. It's the close of the 11th century. There is no France, no Spain, and the German states are largely under the tutelage of the Holy Roman Empire. After riding west to help the Castillian king reclaim his lands from the Moors, a knight named Henri of Burgundy inherits the Atlantic port city of Porto Cale and its surrounding territory -- the small county of Portucale -- whereupon Henri changes his name, in Portuguese, to Count Dom Henrique. He had barely time to enjoy his new status when he was asked to set sail for Jerusalem, arriving just after its conquest by Crusaders. Little did Dom Henrique know that his decision to sail to Palestine would mark a pivotal moment in the history of his newly-acquired land, for the people he'd meet in Jerusalem would one day shape the destiny of his tiny territory. Henri of Burgundy, later Count D. Henrique. On his second voyage to Jerusalem in 1103 Dom Henrique's arrival coincided with that of two proto-Templars: Hugues de Payns and Count Hugh de Champagne. Originating from the same Duchy, it is likely that both Hugues and Dom Henrique got to know each other over the next three years, especially as both men shared the vision of a temporal new kingdom accountable only to God. Traveling with Dom Henrique was another man of French parentage, Pedro Arnaldo da Rocha, born in Santarem (in what is today Portugal), whose family, the la Roche, were supporters of the burgeoning Cistercian Order. In time, its abbot Bernard de Clairvaux would become the Templars' main benefactor. Young Pedro Arnaldo's presence in Jerusalem was opportune, arriving as he did shortly after the first king of Jerusalem installed members of the secretive Order of Sion in the abbey on its namesake hill. To say he made a favorable impression is an understatement, because by 1116 Pedro Arnaldo resurfaces as a full member of the Order, his signature inscribed on an original document from the Abbey de Notre Dame du Mont de Sion, in which he is addressed in Latin as Prior Petrus Arnaldus. Such a position imbued Prior Arnaldo with immense political leverage. The abbey had established close ties with the knights and monks in the nearby church of the Holy Sepulcher, affording the prior direct access to two individuals living there -- Hugues de Payns and Godefroi de Saint-Omer. That relationship was revealed on July 19, 1116 when a document signed by both Prior Arnaldus and Hugues de Payns declares "good relations are assured between the two Orders." In the relationship between the Order of the Temple, the House of Burgundy, the Ordre de Sion and the incipient Portuguese kingdom, Arnoldo da Rocha would prove to be the lynchpin. He was Portuguese by birth, his friendship with Count Dom Henrique granted him favor within the Portuguese court, and through his family's status, connections with the nobles and ecclesiasts in and around the Portuguese city of Braga, many of whom were of Burgundian heritage. But Portuguese chroniclers give Prior Arnaldo even more credit. They cite him as a key founder of the Knights Templar in the county of Portugale, if not one of the original Templars in Jerusalem: "Arnaldo da Rocha, who was a Templar knight, was one of the first nine originators of this illustrious Order of the Temple in Jerusalem," wrote the historian Alexandre Ferreira in 1735, quoting a 17th century source, Manuel de Faria e Sousa. And Sousa would have been in an excellent position to know, for he was himself a Templar knight. Prior Arnaldo da Rocha as one of the original Templars is both provocative and explosive because it brings into sharp focus an unsettling proposition: were there really only nine original Templar knights? Or was this number merely a talisman, the kind of flourish employed by secret societies throughout that period? We may never know for certain; however, it is categorically stated in the Cistercian chronicles that the original Templars consisted of "Hugues and Godefroi and nine other knights," raising the original core group of proto-Templars to eleven. In 1114 Count Dom Henrique passed away in his adopted homeland. Back in Jerusalem, the Order of the Temple was still in its embryonic stage, yet sources claim the Templars by this time were already present in Portugale: "After D. Affonso VI married his daughter to Count Dom Henrique, they [the Templars] always came to his aid, and did not stop doing so even after the death of his son." An independent German source also states categorically that the proto-Templars forged a working relationship with Count Dom Henrique: "The acquisition of an important property, such as that of the castle of Souré, which was given to them [the Order of the Temple] by Count Henrique in 1111 proves that these knights had already rendered some services, and that he was convinced of their usefulness." Such a donation places the proto-Templars firmly in the county of Portugale a full seven years before their official date on Temple Mount. And it wasn't the only documented property they were awarded in that period. Shortly before he passed away Dom Henrique signed another document providing them with a residence in the city of Braga, described as being 'beside a Templar hospital', which would be the hospital for the poor founded by the city's Archbishop Payo Mendes, "annexed to the main houses he had earlier donated to the Templars in the hermitage." These acts of goodwill from an archbishop seem unusual until one discovers Payo Mendes' second, secret job was that of Prior of the Knights Hospitaller, the sister organization to the Templars. But Payo had a third job. He was mentor to the late Dom Henriques' son, Afonso. While Mendes groomed Afonso for his future role as first king of the Portuguese, the Templars continued to amass properties in and around Braga, and inevitably the city became their headquarters, as one Templar Master asserted: "De Domo Templi, quest est in Bracharensi Civitate," 'the home of the Temple, which is in the city of Braga'. The rate at which they received properties on Portuguese soil far eclipsed donations given to the Order elsewhere in Europe, and particularly so around the end of 1125. In the late part of that year the Templars grew noticeably active on Temple Mount, with several knights returning to Europe, as evidenced by the appearance at the Cistercian abbey in Clairvaux of the knights André de Montbard and Brother Gondemare -- the former being the uncle of Bernard de Clairvaux, and the latter a Cistercian monk from the Portuguese town of Gondemare, a few miles south of Braga. They were by no means the only knights stirred into action by Hugues de Payns. On the Celtic pagan day of Beltane, May 2, 1125, the Templar Grand Master co-signed a document in which he and Prior Arnaldo of the Order of Sion once more declared good relations between their respective brotherhoods, after which the prior also becomes suspiciously absent from Jerusalem. Writing of this notable event, the chronicler Lucas de Santa Catarina states how "the Grand Master dispatched several knights with powers to establish the Portuguese crown. Four of the Knights were Dom Guilherme, who supervised the others, Dom Hugo Martiniense, Dom Gualdino Paes, and Dom Pedro Arnaldo. They had the title and the power of Procurators of the Temple, which they exercised in due course, as many writers agree, while the Order sought to establish a home, and proceed as planned." Joining them on the voyage to Portugale was a fifth Templar Procurator, Raimund Bernard. No doubt Brother Gondemare and André de Montbard shared this explosive piece of news with Bernard de Clairvaux at his abbey. And yet to the Cistercian abbot this was hardly news, merely confirmation. Bernard had been contemplating the idea of establishing a temporal New Jerusalem, a model nation-state that would come to represent the epitome of true Christian ideals, because back in 1119 Bernard himself had dispatched a delegation of monks from Clairvaux to the Portuguese county -- domain of his late uncle Count Dom Henrique -- to found a monastery. One of those eight monks was Brother Roland, one of the founder Templar knights. Given these associations between the Cistercian monks and the core Templar brotherhood it can be argued that both the Templars and Cistercians were working toward the same end -- not to mention the Ordre de Sion, for not only was their abbot now also a Templar Procurator, and Portuguese at that, but brothers Gondomare and Roland are also listed as members of that same order. No sooner had the five Templar Procurators landed in Portugale in 1125 when they received the first of many property donations: a small town near Gondemare called Fonte Arcada. The document was witnessed and signed, "I, Guilherme, Procurator of the Temple in this territory, receive this document." But this Guilherme Ricard was far more than that, for his name appears on a second grant -- for half the estate of Villa-nova donated "to God, and the brotherhood of the Knights Templar" -- this time in Latin as Magister Donus Ricardus. 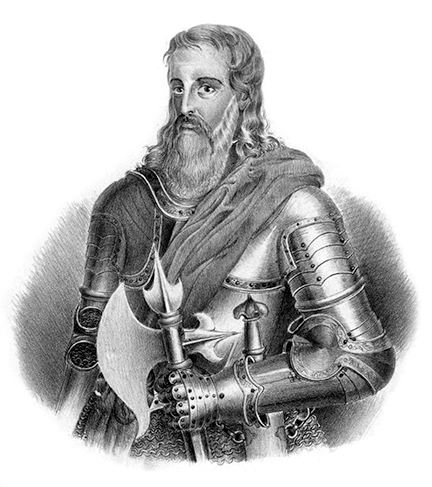 Guilherme Ricard was the first Master of the Knights Templar in Portugale. All these events preceded the Templars' official blessing by the Pope at the Council of Troy in 1128. And barely two months after the famous event, Portugal's independence was secured by prince Afonso Henriques, son of the late Count Dom Henrique. That the Templars were central to this event is shown in the declaration document which bears the first-known Templar logo. Portugal's charter of independence featuring Templar logo. Just as the first two kings of Jerusalem were "greatly obligated" to the Order of Sion for their positions, so prince Afonso was said to be "greatly obligated to members of the Order [of the Knights Templar]." This relationship became all too clear in 1129 when the king-in-waiting reissued the charter for the castle of Souré, -- the one his father had donated to the Templars before they were thought to exist. Afonso's wording on the reconstituted charter to the Knights Templar unequivocally reveals why he was so "greatly obligated" to the order: "I make this donation, not by force or by persuasion, but for the love of God, and for the good of my soul, and of my parents, and by the cordial love that I have for you, and because within your Brotherhood and in all your works I am a Brother." The Templars had placed one of their own on the throne of Portugal, and more to the point, Afonso was also the nephew of their main benefactor and spiritual compass, Bernard de Clairvaux. Thus the Templars, the Cistercians and the Order of Sion secured their territory as far from papal interference as one could get in medieval Europe. The big question is, what were the Templars doing there, years before they were officially sanctioned in Jerusalem? Much of the answer becomes evident if one examines the spiritual aspects of the inner brotherhood that constituted the nucleus of the Order and the age in which it manifested. The 12th century was characterized by an economy based on plunder and an overarching religious entity that tolerated nothing outside its strict Catholic dogma. Self-empowerment was denied, and worse, to connect spiritually with your god required doing so through an intermediary such as a priest or bishop. The alternative route to spiritual self-expression was through initiation into the Mysteries taught by Gnostic sects such as the Cathars and Bogomils, or the teachings of their predecessors the Essenes and Nazorites, particularly those of their priestly messiah John the Baptist, whose doctrine of living resurrection the Templars honoured. These rituals and beliefs are echoes of ancient Egyptian Mysteries schools whose central tenet was the enlightenment of the individual in this lifetime through a voluntary out-of-body experience, an initiatory (and figurative) resurrection, otherwise known as the ritual of 'raising the dead'. Initiates were exposed to a knowledge that opened their vision and understanding of the Universe, and when their consciousness returned to the body they were considered enlightened or 'risen'. By contrast, those who fell outside the teachings walked through life as though asleep, they were viewed as unaware or 'dead'. In the 12th century such ideas had fallen foul of the Catholic Church and its monopoly on resurrection, particularly its carefully selected canon which was based on a literal and erroneous interpretation of this experience -- a fact asserted by the apostle Philip, who maintained that anyone who believes in a literal interpretation of resurrection is confusing a spiritual truth with an actual event. Needless to say his gospel was suppressed for sixteen centuries. Any sects who practiced 'raising the dead' were systematically run underground or met a slow and gruesome death. Shortly before their persecution the Essenes buried scrolls outlining this ritual under Temple Mount. Around 1120 the Templars unearthed the first set of scrolls after tunneling under Temple Mount. Godefroi de Saint-Omer, one of the original knights, brought them back to his namesake town to be decrypted by the scholar Lambert; other scrolls were handed to a Kabbalistic School in nearby Troyes who enjoyed the support of Bernard de Clairvaux. Like the Essenes, the Knights Templar also consisted of two groups: an outer group who dealt with temporal matters, and an inner brotherhood who followed an initiatory Gnostic tradition of enlightenment and whose behavior and ideas were more akin to a ministerial college. Entry required a waiting period of one year, and vows made by incoming Templar recruits such as Arnold of Sournia unequivocally imply that admittance into this exclusive group held a promise of considerable spiritual benefit: "I, wishing to come to the joys of Paradise, surrender my body and my soul to the Lord God." If it is indeed true the Templars followed a rite of spiritual practice based on Gnostic traditions -- and by all accounts it did -- they would similarly have conducted their initiations in secret underground chambers, much like the Essenes did under Temple Mount. In what amounts to a smoking gun, a document found in the possession of Templar Master Roncelyn de Fos called The Rule of the Elected Brothers, unequivocally states: "Build in your houses meeting places that are large and hidden that can be accessed by underground tunnels so that the brothers can go to meetings without the risk of getting into trouble...In the houses of unelected Brothers, it is prohibited to conduct certain materials pertaining to the philosophical sciences, or the transmutation of base metals into gold and silver. This shall only be undertaken in secret and hidden places." Such chambers still exist below original Templar buildings in Sintra, Portugal, a town donated to Gualdino Paes -- one of the five knights sent by Hugues de Payens to "establish a Portuguese crown" and who later became Templar Master of Portugal. The Templars' properties in Sintra now serve modern day businesses, such as the Hotel Central and Café Paris. 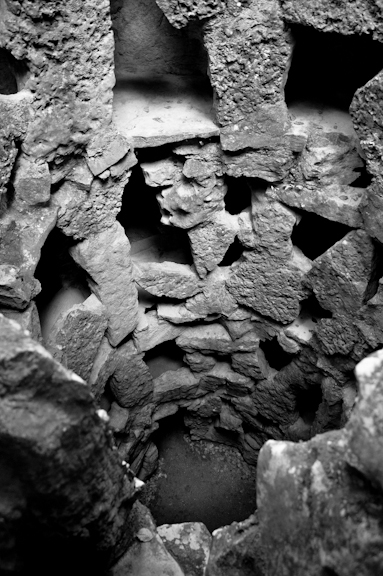 In 1970 a hypogeum or ritual chamber with access tunnels was discovered beneath said café, with a connecting passageway leading one way to the nearby Palace, and the other uphill towards the Templar castle. Fifteen minutes' walk from Sintra's main square lies another property that right up to the Middle Ages was described as the Forest of Angels. Today it is the site of an extensive property owned by successive Masonic families dating to at least the early 18th century; in 1371 it was still in the possession of the Knights Templar. Its gardens can only be described as a deliberately designed ritual landscape. One of its many wonders is a labyrinth of tunnels penetrating deep into the bedrock of the mountainside, as though meant for initiates wishing to immerse themselves in the womb of the Earth Mother, much like Gnostic sects have done throughout history. One tunnel leads to a shaft sunk forty feet into the earth. It is officially described as a well yet close examination shows it never did, nor is it capable of retaining water. It consists of five levels of unevenly stacked and undressed limestone blocks, here and there patched and repaired. Behind the blocks hide five low and narrow circular galleries, each accessed through claustrophobic spiral and in a style that suggests a later refurbishment. 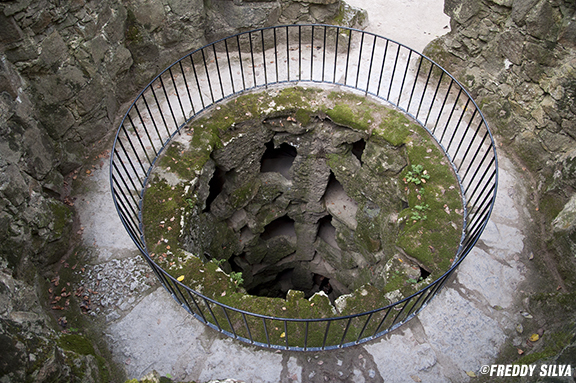 The top of the shaft is literally an eighteen-foot diameter hole, level with the ground and surrounded by a rough, dry-stone wall in the shape of a horseshoe. The entrance faces northeast and, like Stonehenge's horseshoe of bluestones, it references the highest position of the light, the summer solstice sunrise, an esoteric reference to ancient wisdom and, coincidentally, the feast day of John the Baptist, to whom the Templars dedicated a disproportionate amount of churches in Portugal and elsewhere. The view inside the initiation 'well'. But by far the greatest evidence pointing to the Templars having followed mystical practices and rites of initiation of the Mysteries appears in the town of Tomar. And the manner in which they inherited this property is nothing short of extraordinary. Once Afonso Henriques secured the Portuguese nation-state with Templar assistance, he awarded what amounted to a third of his territory to the brotherhood, who in turn made good use of it by creating a kingdom within a kingdom. Its center was Tamarah (as it was then spelled), named for the daughter of Jesus and Mary Magdalene. The name means 'palm tree', so it similarly represents the symbol of the resurrected Egyptian god Osiris. Before they set about rebuilding the town, the Templars undertook a near pathological interest in re-erecting a dilapidated church, Santa Maria do Olival, which later became 'mother of all Templar churches'. 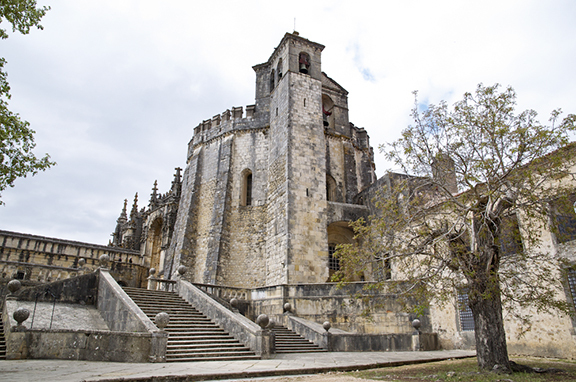 Indeed, all twenty-two Portuguese Templar Masters would be buried in this unimposing edifice. Clearly Tomar was a focal point of the Templar empire and served some undisclosed purpose in a larger plan, for it was from here that their maritime empire grew after the Order's supposed destruction in the 14th century; in Portugal the Templars simply changed their name and continued business as usual. From the church's crypt a tunnel branches off in two directions, one towards the main plaza of Tomar and its unusual church dedicated to John the Baptist. It's passage is marked by a mysterious pyramidal stone relief of a dog (representing Sirius, the star associated with ancient knowledge) and a lion (representing Regulus, the bright star in Leo, referred to as the Royal Star and the gateway to the records of all knowledge). From there the tunnel veers uphill to what became the Templar's most famous building, the rotunda. The rotunda or charola of Tomar, the Templars' most famous building. Like the Abbey de Notre Dame du Mont Sion in Jerusalem, the rotunda stands prominently on a limestone hill overlooking the town. Around the periphery of the enigmatic building are symbols relating to esoteric practices, along with the emblem of the mysterious Ordre de Sion, the cross and rose. The rotunda is described as a church yet never did it have an altar. Or for that matter a door. Entry into the original building was via a tunnel beneath the floor. During one visit to the town's archives I came across an account of restoration work conducted in the 1940s describing how the exterior of the rotunda had been coated with reinforced concrete that hid or destroyed the entrance to a crypt. It was then I came across an account of a stone mason who'd performed restoration work in the rotunda at the end of the 19th century. "It was the habit of one of these masters to return home and register the alterations made inside the castle, because these would continue until much of what was old would be made unrecognizable or made to disappear. One of the things that riled him the most was the disfiguration of the beautiful and intriguing Arab pathway that the old monks of the Temple used in their ceremonies and led directly to the basement of the Temple church [the rotunda]." Inside the rotunda where a secret crypt lies below the floor. Even in those days the brothers living in the convent used to share stories with the masons of how Master Gualdino Paes brought back from the Holy Land the plans of the Holy Sepulcher that were to be used for the construction of the rotunda. Master Gualdino also ordered a pathway leading to it to be constructed in the Arabic style, and that both were used not just for secret religious ceremonies but also for the investiture of new knights. The monks also spoke of the Templar Master returning with many scrolls. He kept them safely in a room excavated out of the rock, which the monks referred to as the 'gate to the underworld'. This doorway rested on very old stonework upon whose uprights the Templars carved dragons, and on the supported lintel, a kind of winged serpent. During recent attempts to beautify the perimeter of the castle of Tomar and its rotunda, an area was cleared around the original Almedina gate. Below it there is a doorway into a cave. The lintel stone is still in place, and indeed a kind of winged serpent is carved upon it, flanked by the heads of two dragons; a drawing made in 1918 shows the engravings still in their entirety, accompanied by a description of which parts of the Arab pathway were visible inside the subterranean passages leading to the chamber beneath the rotunda. The Knights Templar in Portugal may very well have continued the initiatory practice of 'raising the dead'. During interrogation by the Inquisition, a Templar knight cryptically stated: "There exists in the Order a law so extraordinary on which such a secret should be kept, that any knight would prefer his head cut off rather than reveal it." This statement has caused a flurry of speculation as to what secret the Templars were privy to. Were they simply following a rediscovered secret doctrine of initiation or was there something else? One well-studied route revolves around the protection of a holy bloodline, championed very convincingly by the authors of Holy Blood Holy Grail. During my own research to discover why the Templars created Portugal for their main center of activity -- an subject barely touched by Templar historians until I wrote First Templar Nation -- it seemed to me that they wanted to be as far from Rome as possible -- this secret required protection from papal interference, and the Portuguese were tolerant of such a policy because traditionally followed a policy of paying lip service to papal authority. If you recall, the Templars, to all intents and purposes, were an extension of the Cistercian Order and its abbot Bernard de Clairvaux, a number of its key knights being Cistercian monks. A goodly number were also high ranking members of the Order of Sion, particularly its prior, Pedro Arnaldo. One of the declared aims of the Order of Sion was the reinstatement of a holy bloodline upon the throne of Jerusalem, if not the throne of a European state. This bloodline descended from the House of Troy, through the line of David, and into the Merovingian dynasty of medieval Europe. The Order of Sion accomplished the first objective when it seated the Merovingian Godefroi de Bouillon upon the throne of Jerusalem following the conquest of the city. Such a holy bloodline was considered a great treasure, and given the brief longevity of kings of Jerusalem in this era, it is possible the Order of Sion planned to elect another Merovingian, this time in the relatively safe territory of Portugal -- someone who could be groomed and protected by the Templars and their successors. Perhaps. There is a surviving document held in the Cistercian archives which outlines the rites of succession of Templar Masters in Portugal, in which the swearing of allegiance by every new Master unambiguously declares a vow "to protect the bloodline of David." Such a blatant line item would hardly be featured unless there was a bloodline to protect. But the other aspect of the Templar secret and the creation of Portugal lies in their association with the Grail, or Graal. Although perceived as many things, ultimately the Graal describes the journey of a hero who undertakes a perilous journey into a mystical land and returns transfigured by the experience and the knowledge he's exposed to, whereupon he has a spiritual awakening. So to anyone who understands the Mysteries, the Grail is not an object but the search for the highest spiritual potential within oneself. In the religious climate of medieval Europe nothing could be more dangerous. The Templars reversed the tide of ignorance perpetuated by the Church by offering anyone the chance to experience this living resurrection, to which end they built countless secret chambers, much like their predecessors from Egypt to ancient Japan, and this is perhaps the single-most reason why both rich and ley people donated all their worldly goods to help the order succeed. It must be stressed that the living resurrection has historically been performed in secret chambers and ancient sacred sites. Science now knows that such ancient temples are found at the intersection of the Earth's electromagnetic pathways. This concentrated energy is known to stimulate areas of the brain that lead to altered states. Such a spiritual technology is a pre-requisite for inducing the voluntary near-death experience that sends the candidate on a shamanic, out-of-body journey. It was the key ingredient in living resurrection ceremonies. And virtually every site won by the Templars was an ancient sacred site, typically dedicated to Isis or her regional doppelganger. As a Templar knight, king Afonso Henriques would have been privy to the Templars' spiritual teachings and the attainment of this inner transformation, the Graal, and it merited awarding the order one third of his land, to establish a kingdom within a kingdom. On the king's charter lies the unusual cross symbol symbol with the anagram PORTUG-R-AL. In Portuguese it reads 'through you, the Graal.' Afonso is alluding that the Graal is to be found in this territory, specifically the town of Tomar, particularly when one considers the name is also a metaphor. In Portuguese it means 'to drink, to imbibe', and in esoteric circles, an initiate of the Mysteries must 'drink' the knowledge if it is to be internalized. The successful candidate would complete the final initiation by undertaking a voluntary near-death experience, to be awoken by an adept in the morning and lifted from a figurative grave. At this moment they were declared 'risen'. This initiation is still performed today by the Templars' progeny, the Scottish Rite Freemasons. 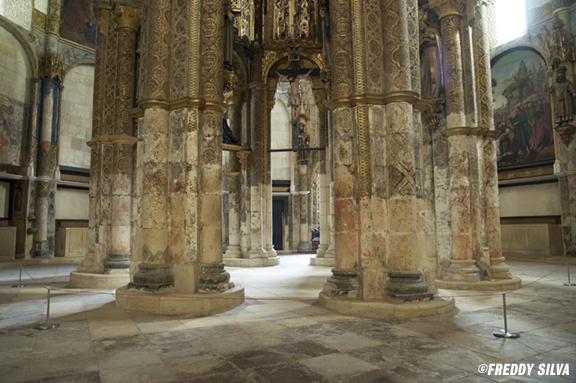 The Templars left clues that the crypt under the enigmatic rotunda of Tomar was used for such a purpose. If you trace a line through the rotunda to the Templar church of John the Baptist, the line passes through two pillars with the pagan symbols of the dragon and the green man, symbols of rejuvenation, and ends 2000 miles away in the church of Notre Dame du Mont Sion in Jerusalem. 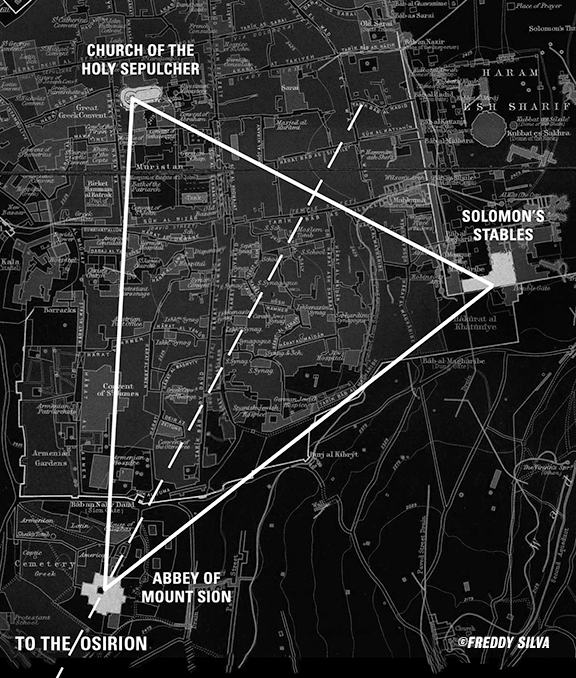 If you then take that church plus the other two prime Templar sites -- the Holy Sepulcher and Solomon's stables (where they resided) -- this perfect triangle is bisected and the imaginary line ends in Egypt, specifically in the underground chamber called the Osirion, where the oldest resurrection ritual of Osiris was once celebrated. The Templars' three main buildings in Jerusalem form a perfect trinity. Bisect it and the line goes to the Osirion in Egypt, the site of living resurrection rituals. We are presented here with the intriguing possibility that the Templars placed the Graal in Tomar. All these centuries, while we've focused on their exploits in Jerusalem and France (and to some degree in Britain), like the smokescreen myth of nine knights protecting a pilgrim trail, the stories have distracted our gaze away from the main accomplishments taking place in this remote country they created before the order itself was made official. It is indeed an incredible coincidence that just as the Templars are erecting their mysterious rotunda in Tomar, the Graal writer Cretien de Troyes begins writing his famous opus. In the story, the Graal rests on a salver, a ceremonial silver tray. One has to wonder, then, why the Templars called this round building a charola. Because it literally translates as 'a salver' -- a most unusual name for a religious building that stands at the crossroads of two electromagnetic lines, and never had an altar or a door. The Templars, it seems, gave us the answer on a silver tray. Other interesting books by the author, Freddy Silva at www.invisibletemple.com.